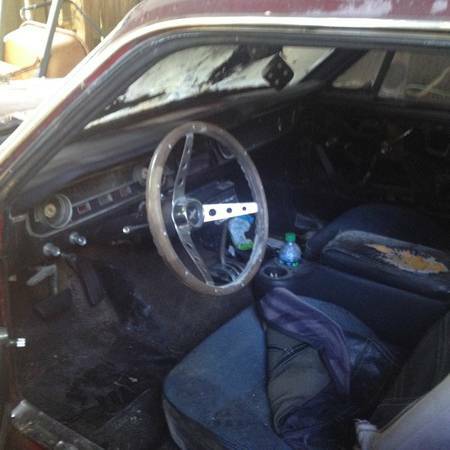 Sometimes you come across a listing that has to have an interesting back story – clues in the picture suggest it’s more than just hoarding or someone selling a no-longer-needed car. Today’s feature is such a listing – both cars look like they were once in great shape, and the seller had broad enough interests to have both an iconic American coupe and an unconventional Italian sedan. Check out this 1968 Alfa Romeo Berlina and 1965 Ford Mustang, for sale for $1500 (for both!) in Tampa, FL. The Berlina looks pretty good – the prugna paint looks like it only has light oxidation, and if you look really closely there’s perhaps a hint of rusting at the bottom of the driver’s door. In Florida’s climate, that probably means this car has been sitting for quite a while, maybe even one year! But seriously, the car makes a very decent impression. What is visible is complete, and the owner upgraded to later 5-star wheels from a 1980s spider. Why was it parked? This car by itself suggests it wore out its welcome, but the title is not available, so perhaps it’s an estate sale and the executors can’t find paperwork. Of course, this shouldn’t be a problem if you can register it in a no-title state. Okay, so there is a little rust on the trunk lip, and perhaps on the rear wheel well. This appears to be a European market model, as it’s got amber turn indicators and a large-format license plate frame with bumper-mounted lights. 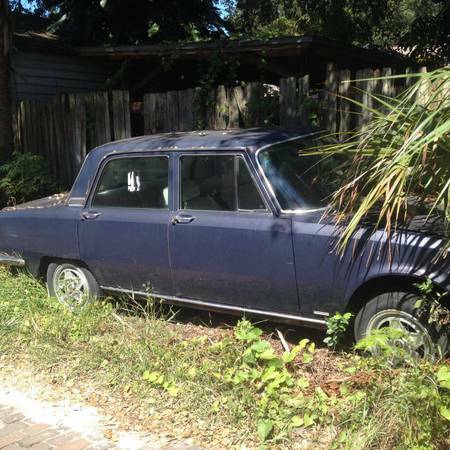 In the worst case, this car is worth $750 in parts alone, making it a proper steal. And if it’s a runner, you could probably do better – let’s hope the head and carburetors are still on there. 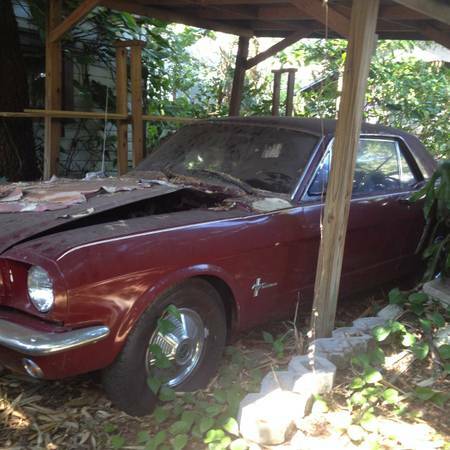 Here’s the other car, a 1965 Mustang, included in the $1500 total. It too looks like it was once a cherished classic, though the bent hood and peeling paint suggest an engine fire laid it low. Nonetheless, the damage doesn’t look too extensive, and if it’s a complete loss, you wouldn’t do too badly parting it out. But with the huge aftermarket for these, you shouldn’t do too badly. The interior looks like it wasn’t too heavily affected by the fire, so perhaps it was caught early enough. Maybe the best use of this car is as a LeMons racer. It’s an automatic car, and due to the fire, is bound to have some rust after exposure to the humid climate. That said, at this low price you might be able to fix it up – assuming the corrosion isn’t too extensive – and actually make some money on the thing. What would you do with this Ameritalian pair? This entry was posted on October 21, 2015 at 10:31 am and is filed under Feature. You can follow any responses to this entry through the RSS 2.0 feed. You can leave a response, or trackback from your own site. By the way, welcome to the Pacific Northwest! 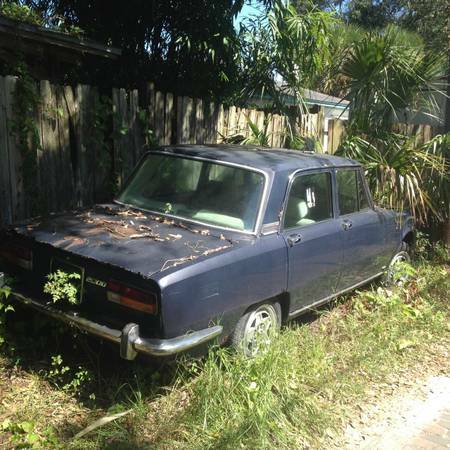 I think the purplish tinge to the Berlina is from decades of Florida sun–oxidation. Prugna is definitely an acquired taste, although certainly a unique period color. I was actually hoping for a blue or a green shade (really just wanted to stay away from stereotypical Alfa bright red, although that’s not nearly as common on Supers/Berlinas as GTVs/Spiders). But I knew I’d kick myself for passing on the car solely because of the color and it’s grown on me. Mine got a high quality respray around 2000 in Europe–likely better quality paint than Alfa was applying at the factory in those days. wow,, this is only 250 miles from me and I’ve been wanting a Berlina for awhile; too bad I’m completely strapped this week as a result of choosing the wrong person to be in business with.